Happy Friday, all! It’s been a few weeks since the last time I shared a checkIN & checkOUT post. The August schedule around here is bananas…it’s when we do our family vacation to the lake, and football starts up and we’ve been getting ready for back to school. Time just slips through my fingers during the month of August, anybody else? Like, how is it September next week? However, before we get to September, I have to mention that my baby, my first born, is turning 10 on Monday. Cue the violins! How has a decade gone by already? It’s strange though. Maybe it’s because he was an old soul from the start, but I love watching him grow up. He is so smart and inquisitive and determined. Don’t get me wrong, the boy can make me crazy. But I just love watching to see what he’ll do next. The kid’s going places. Be sure to make the most of the grill while you can. Before you know it, it will be time to wheel it back into the shed or garage. 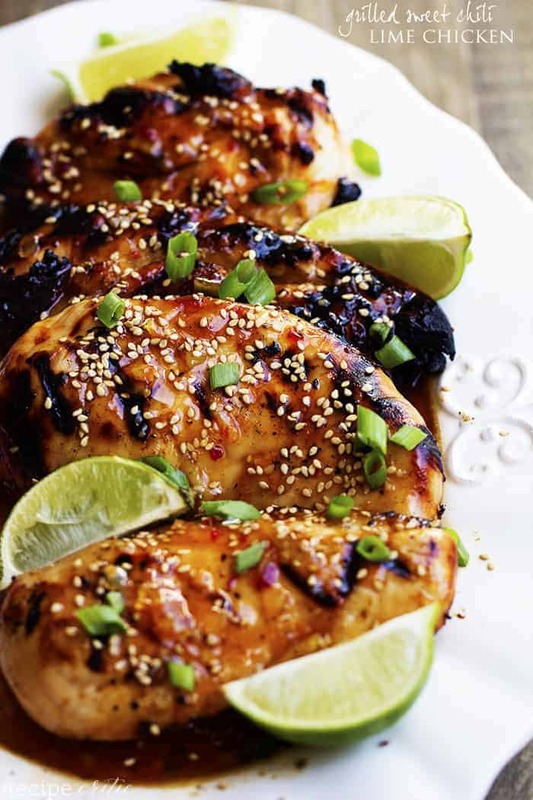 This Grilled Sweet Chili Lime Chicken from The Recipe Critic, Alyssa, would be perfect for a Labor Day BBQ! It looks amazing. 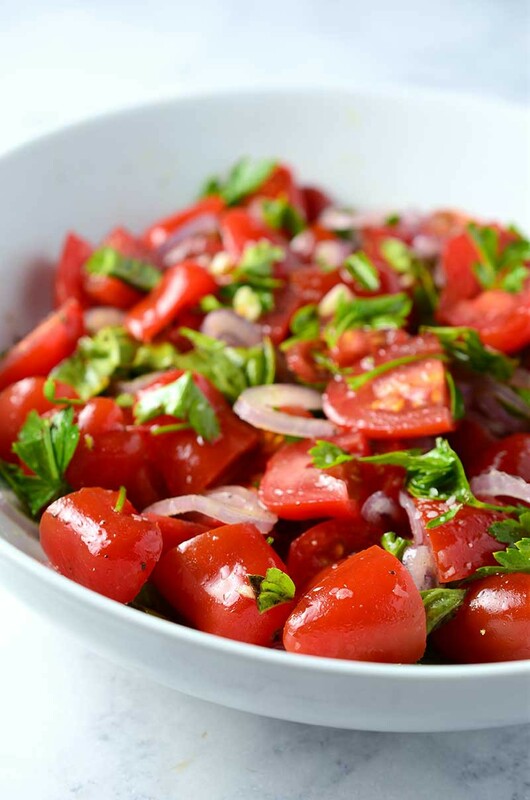 The name of this recipe says it all: Simple Summer Tomato Salad. The tomatoes this time of year are absolutely mouth-watering, so eat as many as you can right now! I love that this salad is no frills and would be perfrect along grilled anything. Get the details from Des at Life’s Ambrosia! This recipe looks like a winner! 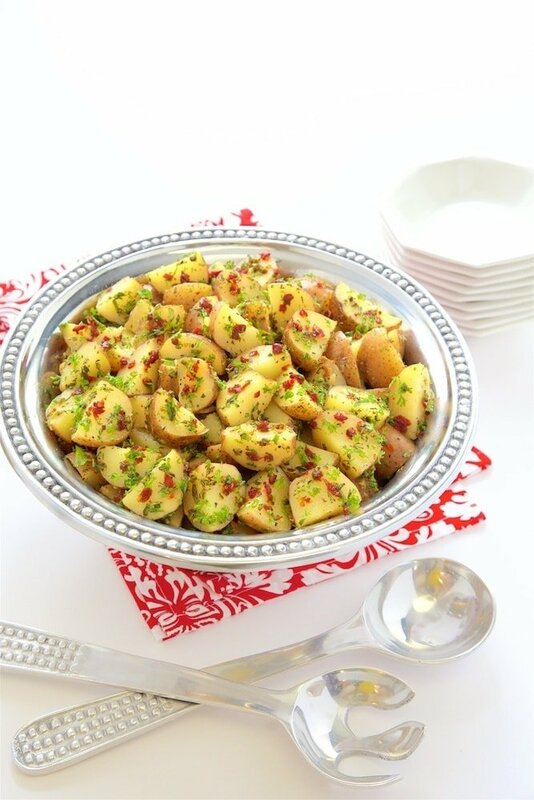 Another one perfect for a Labor Day party…simple and delicious flavors, and can easily be doubled or tripled to feed a crowd. Visit Scott and Chris’ blog, The Cafe Sucre Farine, for the details! These Red, White & Blue M&M Chocolate Chip Bars are the perfect thing for Labor Day weekend! Simple, quick and easy, they are perfect to bring to a bbq or picnic or make to serve at your own party. I shared this recipe for the 4th of July…you can see the original post here. 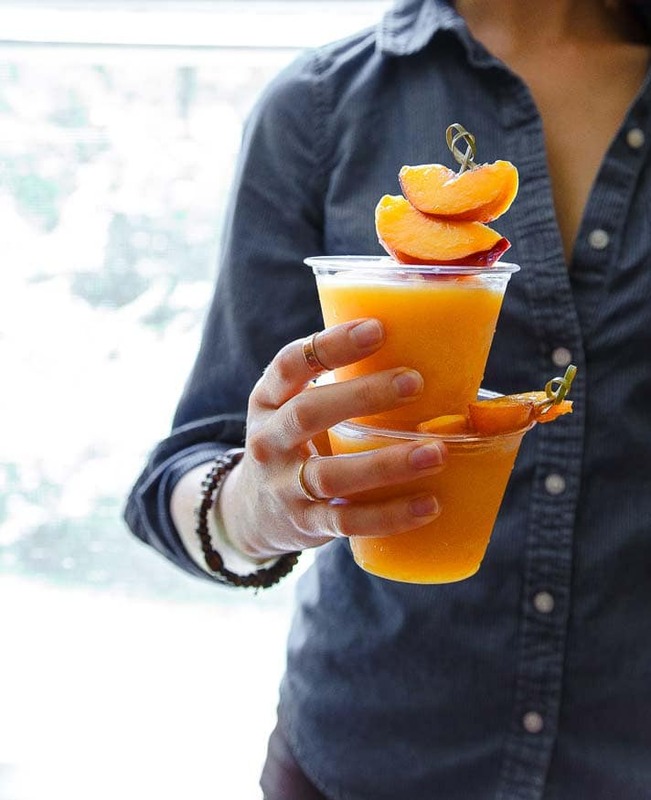 I will for sure be making Christina’s White Wine Slushies on Labor Day weekend. Just like tomatoes, peaches are at their best in late summer and this recipe combines their sweet flavor with crisp white wine: Slam- Dunk. Head over to Desserts for Two to read all about this concoction! Well I hope you all enjoy your last few days of summer break and survive the back-to-school madness. Isn’t it so lovely to know we have one more long weekend to enjoy? If you happen to try any of these treats, please snap a pic and share with me on Instagram with #checkincheckoutfriday! 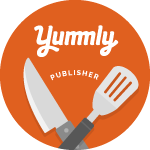 Just a reminder, I collect all the recipes, ideas and products I mention in my checkIN & checkOUT posts each week on a Pinterest Board for easy reference…follow it here! And come back and checkIN next week to checkOUT some more great finds! Wine slushies?!?? Where has this been all my life? Love everything else too!? OH! What a treat. I am so glad I read your blog and my family will be even happier! Thank you! I just finished breakfast and was completely full until I came across this amazing goodness. Give me a serving of each and everyone of those goodies. These look absolutely delicious! I will definately add some to my need to try list! OKAY!! I love food and am always looking for new recipes these are a MUST!